Food for fishes always contains rich crude protein, but the crude protein in the food is hard to digest for the fish. 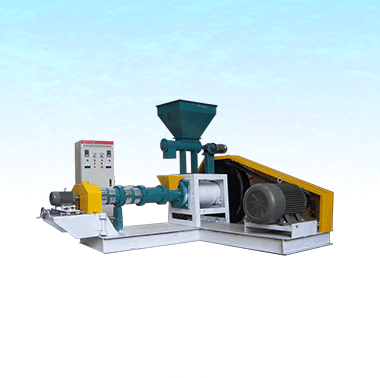 After being processed by the fish feed pellet extruder, the feed can be easy to digest. Similar with wet type fish feed extruder, dry type also uses alloy steel. 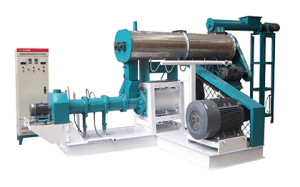 Dry type fish feed extruder is suitable for small- or medium-scale fish farms and fish feed industry, for processing shrimp feed, prawn feed, floating fish feed, sinking fish feed pellets and pet feed pellet. Under the action of the frictional force of the principal axis and flat-die, the compression roller spins. The high temperature between the roller and die ripens the starch of the materials, and the protein becomes congealed. Then the fish feed is extruded from the holes of the die. Fish feed pellets are conveyed out of the extruder. Additionally, we can choose the length of the feed by regulating the angle of the cutting knife. 1.Simple structure, widely used, small flooring space, low noise. 2.We can use dry powder materials to make feed pellets without adding extra water into the dry type fish feed extruder. The dry pellet feed is convenient to store. 3.The dry pellet feed is well processed which is easy for the animals to digest. During the process, the pathogenic microorganism and parasites are eliminated. 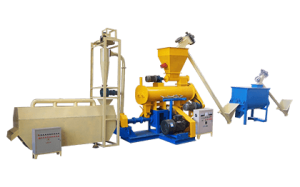 4.This fish feed pellet extruder also applies to make pellet feed for rabbits, ducks and the like. What’s more, the pellet feed is more economical than the compound mash feed. 6.The raw materials can be used in producing pellet feed is various. 1.Blend 5 or 10 kilogram mash feed with edible oil of 5% or 10% together. If the mash feed becomes caking, we should disperse them to keep the feed in powder condition. 2.Put the feed into the extruder before we turn on the machine. Then we should regulate the bolt of the press roller until the feed can be extruded normally. 3.We should do test runs with the oily mash feed for 3 to 5 times before adding dry powder into the machine. And the pellet which is made of oily mash feed should not be used in feeding rabbits. 4.If you want to regulate the length of the pellet, we can adjust the angle of the cutting knives. 5. Feed pellets are hot when they are just coming out of the machine. We should place them in a ventilated room. After cooling down, the feed pellets can be stored in bags. 1.Stay away from the feed inlet when fish feed extruder works. If you want to add materials into it, you should be with the help of a stick, not your hand. 2.We should add materials before turning on the machine. And leave some materials in the extruder when you stop the machine in case the express roller and die mold directly touch each other. 3.If the machine gets stuck, we should turn down the machine immediately. 4.We should loosen the bolt of the express roller after finishing work. 5.Check the degree of tightness of the belt to prevent the belt slipping and decrease the capacity. 6.Add and replace the lubricating oil regularly. 7.It is normal that the temperature of engine rises to 70 degrees after a long continuous working. 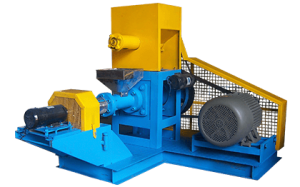 Please send me a quote for the dry feeds pellet machine. Also your address in Nigeria where I can visit for demonstration. Please send me the price of dry feed pellets Machine. Hi what is the price of your dry and wet floating feed extruder ? Can you send me prices for each of the models for dry pellet extruder?